I have been a long-time fan of Emily Cier’s quilt designs from her pattern company, Carolina Patchworks. So when she wrote and asked if I’d be interested in joining the blog tour for her new book, it was a total no-brainer. I knew the book would be well-designed, well-written, and have lots of very cool ideas. I was (as usual–ahem) not mistaken. Quilt Remix is a small volume that packs a lotta punch. Emily has taken 10 traditional quilt patterns–like the Log Cabin, Flying Geese, and Dresden Plate–and made them modern, fresh, new, and very cool. Her simple twists, like varying the size of fabric cuts and altering the symmetry of some of these traditional blocks, make each design seem like something you’ve never seen before, even though you almost certainly have. As with all of Emily’s designs, the patterns in the book are clearly written and simple to follow–even for the more complicated blocks. She varies the necessary skill level–from beginner to intermediate–but makes sure that you have the tools to be successful with each one. As someone who has been interested in more traditional, classic quilt designs but less-than-inspired by some of the examples out there for inspiration, I love that I could pick up this little volume and find something to get excited about. Probably my favorite part about each pattern is the way Emily gives the variations necessary to make each quilt in crib, throw, twin or queen sizes. I’m actually not totally sure why this struck such a chord with me, except that it makes me feel like I have more control over the design and the outcome, and that maybe I can see a little more clearly how to alter the pattern to suit my needs. I like patterns that teach me as I work with them, you know. If you’re new to quilting, I love that this book gives you a great way to test drive some familiar shapes with some new perspective. And can I point out: Emily’s fabulous patterns sell for $9-12 each (a bargain, considering how cool they are); this book sells for $16.95! So, for less than the cost of two patterns, you could totally have patterns for TEN, plus inspiring variations to boot. It’s a seriously good deal, y’all. 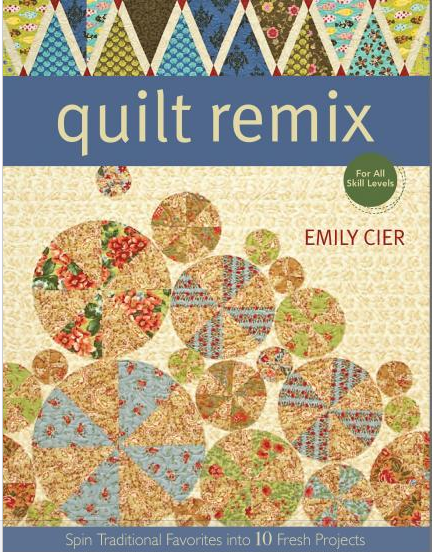 I’m delighted to add that I have a copy of Quilt Remix to GIVE AWAY! 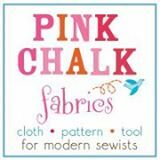 Because I want you to get all the sewing your little heart desires, and I want you to have the tools to do it. To win, simply leave a comment and tell me why you like to (or would like to) quilt with modern patterns and designs. That’s it! Comments will be open through Monday, January 24. Winner will be announced Tuesday, January 25. ← Tonight: Book Signing with Amy Barickman of Indygo Junction! For me, modern quilting is respecting all the history and work of the women (and some men) who came before me, without all the rules and restrictions. What a wonderful book! I love the updating of an ancient art! I love to quilt using modern patterns to challenge myself and I adore the look of them! It’s nice to “quilt outside of my comfort zone” and create new, fresh and funky designs! Thanks for the chance to win this awesome book! I ‘d love to try some of Emily’s takes on traditional blocks! I quilt with modern patterns and designs because they are fun and fresh. This ain’t your grandma’s quilting bee! This book would be great for inspiration and a good reference. I like the fresh, uncomplicated look of modern quilts and would like to try some. Looks like a great book! I haven’t tried too many contemporary or modern patterns because I’m generally a fan of symmetry, however Emily and a few others have brought me around to a new way of looking at modern, and I’m jumping into my first one this year. I can’t wait to see how it turns out! Mixing contemporary fabric with good-old fashioned patchwork makes everything eycatching! I always look out for new ideas and I really would love to win this book! KarinM. I’d love it also! I’ve never made a quilt but I think that if I had something to start with, I might tackle it! I’m particularly drawn to modern quilting when I don’t have a plan or pattern and just start piecing to see where it takes me. All the beautiful fabrics help the traditional patterns look modern, too! I think modern fabrics tend to be brighter & much more interesting to look at, especially when put into quilt form! I’ve been sewing for about 10 years, but I have never attempted a quilt because I thought they were too “old” looking. Now that I’m seeing so many wonderful new fabrics and designs, I’m ready to dip my toes into the world of quilting. I’m not sure if this would be a good beginner’s book, but I’m sure it will offer plenty of useful tips for me. I would so love this! I’m wanting to quilt but do it in a way that has a more updated look. Since I’m new to quilting, I am always looking for inspiration. 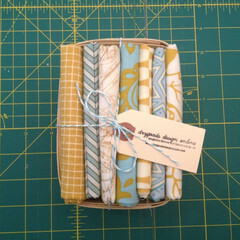 I LOVE USING THE MODERN NEW FRESH DESIGNS, ESPECIALLY WITH THE CURRENT BRIGHT FABRICS! THANKS FOR SHARING SUCH A NEAT GIVEAWAY! I entered the quilting world as a trad quilter, following in the tradition of my grandmother. I have begun to quilt in a more modern way, creating quilts of my own design incorporating much more “space” and focusing on the prints I feature. I absolutely love the idea of this book, because I haven’t yet found a way to bring the trad quilt world and the modern quilt world together, on my own. Thanks for the giveaway! This looks like a great book! I’m suddenly in love with solid fabrics and I can visualize some of these quilts in solids … Thank you for the giveaway! I quilted years ago and would love to start quilting again. I love to see new inspirational designs using lots of color and patterns! My grandmother is the quilter in the family–quilts for everyone and then some (we have four in our house alone!) fly out of her able and skilled hands. I’d love to make a quilt for HER, something she’d enjoy but also something she’s never seen or tried before. These quilts would certainly fit that role–I think I’d love to make it, and I know she’d love to receive it! I’m ready to change up my quilting style. This book looks like it mayb just what I need to get started! Thanks for the opportunity and inspiration!! I would LOVE to have this book – I enjoy sewing contemporary quilts because of the clean lines and great colors. Thanks for offering this great giveaway! I just started quilting two years ago and love Emily’s blog. I’ve promised quilts to a few members of my family who would prefer modern designs (as do I). Thanks for the chance at the book! I would like to be able to sew quilt tops for my 1 year olds room that are new and fresh and don’t look like something that belong in my great grandmother’s room. She is bright and fresh and she deserves bedding that matches her personality! Having been a quilter since the early 90’s, I’m a wee bit tired of traditional quilts. I have definitely moved onto patterms with a more modern twist, whether via blocks or fabric selection. I would love a copy of this book. I’m especially curious about how Emily writes up instructions for creating the circle blocks. I am new to quilting and in all I’ve seen so far I seem to be more drawn to the modern patterns and designs because of the lines and usually brighter colors. 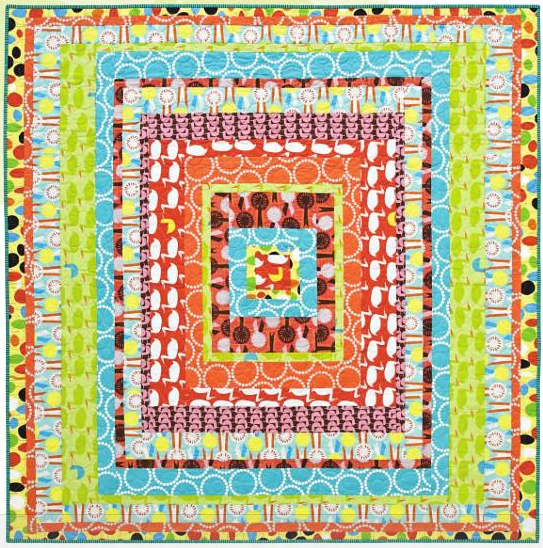 I just love the bright colors and how they work together in the quilts. The more I see about this book, the more I want it! I like to use modern bright fabrics with either modern or traditional quilt patterns. I am interested in quilting with modern fabrics and designs mainly because I have never been interested in quilting until I started seeing quilts with modern fabric and designs and love them! I have a table runner planned for my first project but this book looks incredible. I love modern quilt patterns. Even with plain fabrics, they really seem to make a statement with their clean lines and graphic styling. My daughter-in-law and I just finished one of Emily’s patterns. It is STUNNING! I like the traditional blocks “remixed” into modern quilts. jaybird’s version of the cover quilt is shaping up to be fantastic. Perhaps this book will help jumpstart me on the design of more contemporary quilts vs just trying to get through the steps of piecing each block. Thanks for the giveaway of Emily’s book. Simple quilts, no matter modern or not, resonate with me! I would love to try some new fabrics and patterns. They are so bright and cheerful. Emily’s book looks fascinating! Modern colours and designs seem to make the most of the technology that is now available for creating bright colors. Something I appreciate as chemist! I have to say that I love the fact that Emilys designs are a modern take on traditional designs. Best of both worlds if you ask me. I consider myself a traditional quilter with a wannabe contemporary quilter fighting to get out! While I just can’t get myself to purchase the newest modern fabric lines, I sure like to see designers mix up traditional patterns for mind-blowing quilt designs! Following this Quilt Remix blog hop has sure opened my eyes to new possibilities, thanks to Emily Cier! I’ve been making more modern quilts the last few months and love them. Thanks for a chance to win. modern patterns leave so much room for my own interpretation of a quilt…with traditional patterns i feel like every point needs to be aligned…not my strong point…id rather quilt for enjoyment without the pressure of everything being on the mark. why I like modern quilting? the style is just so appealing to me. I like that the look is clean and simple but usually it isn’t simple to put together! 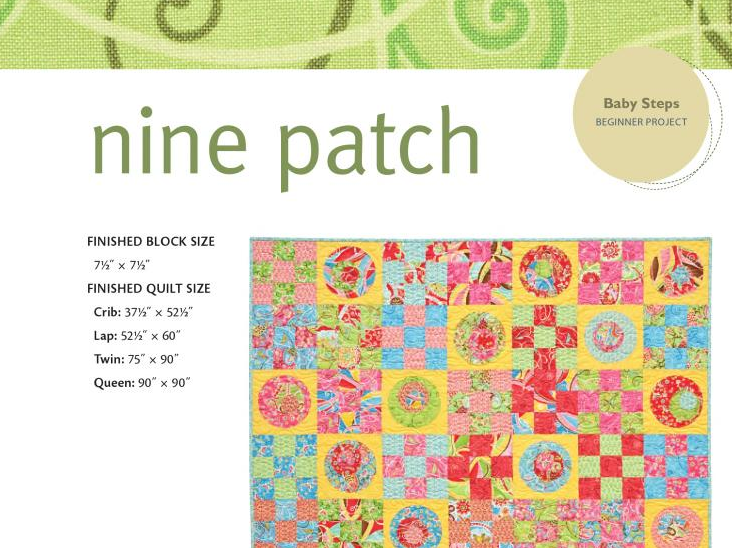 I love quilting with modern designs for the freshness and trendy look it gives my quilts. Love that quilts can look designer and not just antique. I would love to have this book as an inspiration to start working with modern designs. The pictures are beautiful. A finished quilt would be a treasure. 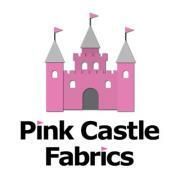 There are so many new fabric ranges that would suit more modern quilt designs and it will be fun experimenting. Thanks for the chance. I am currently finishing(hand quilting) a 25 year old project, a hand pieced Broken Star… made with 25 year old fabrics! Ugh! (Did I really pick those?!) I am newly enamored with all the beautiful, bright fabrics, quilts and quilters abounding online…where have I been? Even without this book, your site is a wealth of inspiration to get going in fresh, colorful ways! The opportunity to win this sparkling book is icing on the (layer)cake! I look to experiment with different colors and designs. Check out BeadStyle Magazine. Their color combinations can be used to give a fresh look to any craft. I would like this to give me new ideas on how to twist quilts I already know! Plus, they’re just darn pretty! My mother-in-law taught me to quilt, and luckily loved the bright modern aesthetic that has emerged as much as I do. She would have loved the combination of traditional designs tweaked with more modern constructions and colors. Please count me in – thank you. I’m new to sewing and would love to be able to make quilts like that! I love the fun fabrics and designs. 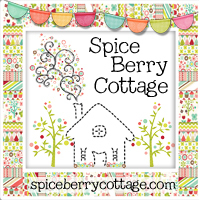 i would LOVE to win this because I am a lover of all things colorful and wonderful! I want to make happy fun quilts but there are not really a lot of modern patterns to use! I am getting into quilting more and I love what I have learned so far! I really really really REALLY hope that I win!!!!! I would like to learn something new. Some “Change” is good! LOL! I like the modern twist as it lets me us my ideas and be artistic. thanks for the chance to win. I have this thing for circle motifs and love the cover quilt pies and tartlets. Thanks for the chance to win the book! I like to quilt with modern patterns/designs because they’re fresh, creative and interesting! I discovered this whole world almost three years ago and now I’m hooked. I’m always planning my next quilting/sewing project…it’s exciting and I love it!! I’d love to win a copy of Emily’s book. Thanks for a great giveaway!! I’m just learning how to quilt – I can’t wait to work on my very first, modern one! I haven’t sewn with a modern twist yet. Looks like fun. I like using modern fresh prints for quilting as I find it appeals to children and younger adults. 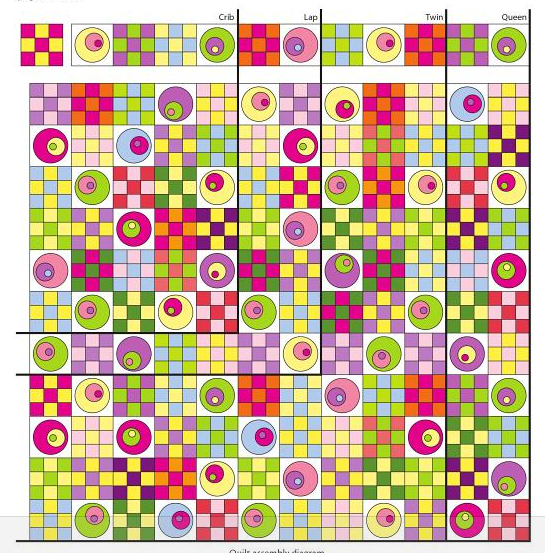 Modern quilt: a fresh new look at established patterns – and more room for error… at least for me ;-). A great use for all the modern fabrics available. Thanks for the give away – the books truely looks like a winner! All the beautiful new fabrics being designed NEED new modern patterns ………so they can sing !!!!! Hi ! I’d love to win this book and do some of these variations! Absolutely love the 9-patch with the circles in it. 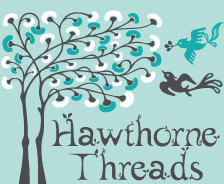 (By the way, I’ve purchased from Whipstitch before but had no idea that you had a blog until now…I’ll look forward to reading you whenever you post now.) Thanks! Thanks for hosting this review and the giveaway too! I am a quilter that wants to break out of the traditional roles of quiltmaking but amazingly find myself a bit timid to do it. That’s a hard thought to factualize on paper but for 2011, it’s on my list of personal challenges. With this book it could only help. Thanks fo rthe chance. I love the clean lines of modern quilting. I’ve been following this blog tour and every time I see the photos from the book I get more excited – it’s really difficult to make something as common as these quilt patterns seem new and fresh, which is exactly what Emily’s done. Thanks for the great giveaway! I like to find new ways to use modern fabrics, we are blessed with some great designers and amazing techniques that make all this possible, it couldn’t be better. My 2-year-old BOY and 5-year-old GIRL are about to share a room with bunk beds. I am looking for a way to make their quilts individualized, but harmonious. This book looks like it has a pattern and would allow me to vary the color story enough to make his look boyish and hers girlish and yet both quilts would still look contemporary!!! All the new patterns and fabrics keep quilting from being a forgotten craft. Keeping it modern keeps it alive, thanks to designers like Emily. Modern quilting fits with my style. I’ve just started quilting and this book would help me get started!! I’d love to try out the Pinwheel pattern. So far in my quilting career, I have not been brave enough to be modern. This book would certainly give inspiration for trying new (for me!) things. Many of today’s fabric lines don’t lend themselves to traditional patterns. I love the large florals and graphics, but they need modern patterns to show them at their best. I love these patterns! They are so gorgeous and so surprising! Sometimes it gets boring making the same blocks over and over again, this book would shake things up and make quilting more exciting! It also makes you think outside of the traditional quilting block! Thanks for the giveaway! I really like fabric, prints, solids, batiks, etc. Modern quilting lets the fabric shine. I think it gives a great impact to the design when it is simpler and fresher. I think that all kinds of patterns are worth trying, you learn so much more by doing different konds of things! I am very drawn to emily’s Ohio star quilt. I think that would be my first project from the book. Thanks for the giveaway! I like the idea of exploring beyond the boundaries of a pattern. It seems very “freeing” to play with a modern perspective. I love the bold graphic feel of modern quilt designs. I’ve been eyeing up my kids’ newly-rearranged bedrooms and itching to make them quilts, but I haven’t been very inspired by the traditional patterns. The modern stuff is fantastic, but I don’t know how to approach it. This book sounds like the perfect introduction. I love modern quilting because it is a little more unrestrained. Not sloppy, but there is less focus on perfection and more on design, which I like. I like the traditional taken to a larger bolder scale. After years of the traditional type of quilting, twisting things up a bit really adds interest and shows a person confident enough to ‘break the rules’. I’m not creative enough to do it on my own I don’t think, so really appreciate books and the net showcasing some prime examples. I would totally LOVEEEE this! I want to learn how to branch out in quilting as far as design and color, this book looks like it has it all!!! I love taking vintage patterns and making them modern. I’m sure I’d love this book. I love the fresh look that she gives to old patterns! I’ve been quilting for only a short time, but the modern quilt styles were what got me started. I love how something can be made fun and fresh with just a little twist to it. I’m a huge fan of Emily’s patterns, and I’d be thrilled to win a copy of her book. I’m only 30 so all I know is modern fun quilts! I’ve always been drawn to the bright, fun, MODERN fabrics so it only follows that my quilting style would follow too. Oh, and Dresden Plates are to die for! Just made my first two last week – easy peasy! I have only been quilting for about a year and I LOVE IT! I can’t wait to get into some really modern designs and progress my talents! Colour and design are so refreshing and inspiring! I don’t want dull dull dull things in my life and ‘modern’ fabrics fit oh so well. I love the use of solid sashing to show off the wonderful fabrics. This book looks awesome!! Thanks for doing this! Stumbled upon your blog thanks to this booktour and wow am I hooked, love your way to write all your exciting project, will be making colored macaroni necklaces with my god daughter that’s for sure! i agree with many other – clean, simple lines. plus it’s a style that can make even my husband like quilts. 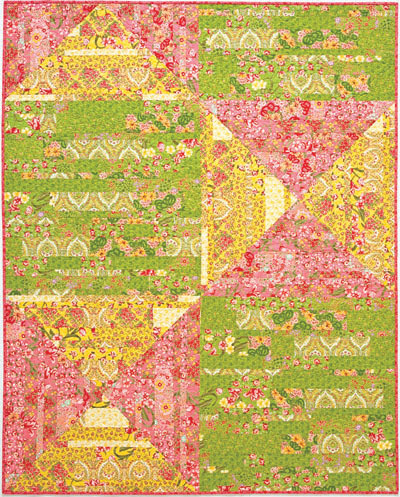 I love the bright colored fabrics used in these quilts. Not only is quilting relaxing, it brings joy to the craft!! I like that the patterns provide information for multiple quilt sizes. Isn’t it funny that each generation likes to put their spin on an art form? Love these spins on traditional blocks. Thanks for hosting! Cheers! Such a happy book Emily as pulled together for us! modern quilting in my own terms is honouring the works as part of their necessity of the people from the past era – without all the rules and restrictions. I’ve done many traditional quilts, but have had the most fun with outside-the-box patterns. It’s easier to showcase great fabrics of any size when you create the pattern to go with the fabric. I love both traditional and modern designs. For me it’s about making something that speaks to me in the moment…that feels relevant. It looks like this book is right up my alley! Looks like a very interesting book. Taking a traditional design and giving it a modern twist is very different. When I started to think about trying to make quilts, I was instantly drawn to the bright colours and simple shapes of the quilts made by bloggers such as Oh Fransson and Film in the Fridge. Then I learned that this type of quilting had a name – modern. I’ve now made two quilts in this style and would love some more guidance from a book such as this one. put a bit of your own personality and style into what used to be a traditional pattern. A lot of them allow you to use the big prints to their full design potential. I love the look of her quits. It’s so fun to see modern fabrics in new patterns. Thanks for the opportunity to win; this looks like such a great book! What better thing is there than to create something (to be enjoyed by someone else!) that represents the past with a beautiful twist for the present, too?? I’m a new quilter (only on my 2nd quilt) but I have been sewing all my life. The new modern look of quilting is what got me started quilting and I would love this book! I love seeing new designs–not that the oldies aren’t goodies, but it’s nice to look at something you’ve never seen before! This book looks great! I would love it! I would LOVE to win this book. Thanks for the chance! this book is TOTALLY AWESOME! there are so many cool projects i don’t where i would start! i would so luv to win this book! thanks for sponsoring the give-a-way!!!! by the way your blog is AWESOME as well!!!! I would love to win this book because I think that it will inspire me to make a quilt that is out of my comfort zone!! !